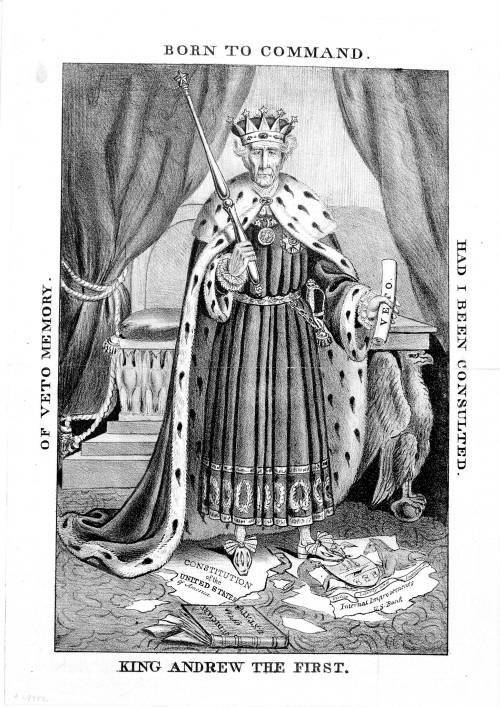 A caricature of Andrew Jackson as a despotic monarch, probably issued during the Fall of 1833 in response to the President's September order to remove federal deposits from the Bank of the United States. The print is dated a year earlier by Weitenkampf and related to Jackson's controversial veto of Congress's bill to recharter the Bank in July 1832. However, the charge, implicit in the print, of Jackson's exceeding the President's constitutional power, however, was most widely advanced in connection not with the veto but with the 1833 removal order, on which the President was strongly criticized for acting without congressional approval. Jackson, in regal costume, stands before a throne in a frontal pose reminiscent of a playing-card king. He holds a "veto" in his left hand and a scepter in his right. The Federal Constitution and the arms of Pennsylvania (the United States Bank was located in Philadelphia) lie in tatters under his feet. A book "Judiciary of the U[nited] States" lies nearby. Around the border of the print are the words "Of Veto Memory", "Born to Command" and "Had I Been Consulted." Weitenkampf cites a variant with 20 lines of letterpress below, attacking Jackson as "a king who has placed himself above the law."